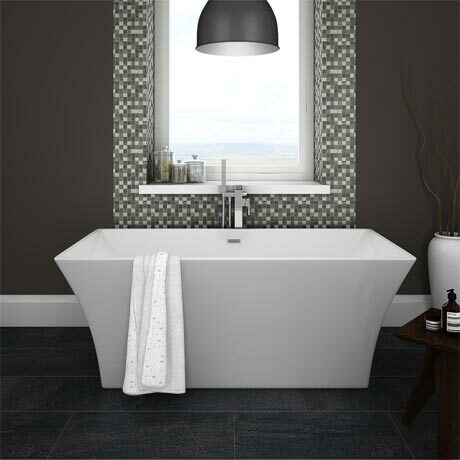 The superb Venice modern double ended square free-standing bath measuring only 1520 x 740mm, featuring smooth swooping lines; bring a super stylish designer look into your bathroom. Manufactured from smooth 4-6mm thick white gloss acrylic with a integrated chrome finish overflow and click clack waste. Looks great with one of our quality wall mounted or floor mounted free standing bathroom taps. "We had been told by a well known Scottish bathroom (specialist) that we would never get our bath in the same style any cheaper, we required it to be shorter than a standard bath, and we were told it's not possible, however Victoria Plumbing came up with the goods. Good job Victorian plumbing."